Shipping estimates for the iPhone X have improved to 2 to 3 weeks across Europe, suggesting Apple's efforts to ramp up supply and production are starting to see some success. The 2 to 3 week shipping estimates are an improvement over the previous 3 to 4 week shipping estimates that have been available since early November. The new 2 to 3 week shipping estimates are available in all European countries where the device has launched, including the UK, Italy, France, Germany, Spain, Denmark, Sweden, Norway, Switzerland, the Netherlands, and more. iPhones ordered today in these countries will arrive well ahead of the holidays, in early December. Other countries in North America and Asia Pacific still list 3 to 4 week shipping estimates, but the last time shipping estimates improved, we saw better estimates in Europe that then expanded to the United States. We expect to see U.S. shipping estimates drop soon. In addition to improving shipping estimates from devices purchased from the online Apple Store, we've also been hearing continual reports from MacRumors readers who have seen their pre-ordered iPhone X models shipping out much sooner than expected. Many who originally had December shipping estimates have already received their devices or are expecting them in November. Apple retail stores are also receiving regular shipments and customers who check stock on Apple.com early and use stock-tracking tools like iStockNow have been able to make purchases with no wait time. Ahead of the iPhone X launch, rumors suggested the device would be heavily constrained and in short supply until well into 2018, but given the improvements we're already seeing, supply/demand balance could be reached earlier than originally expected. Update: Shipping estimates have now improved to two to three weeks in Asia Pacific as well, which includes countries like Japan, China, Australia, New Zealand, and more. Price outside of the US is criminal. Bump up the US prices another 30%, and I'm sure the wait times will decrease state side just as easily. Did my part to help the Apple faithful and other beta testers here in NA. Every little bit helps! Can they release the Sim Free model now? Wow, this is unexpected. So much for the dire supply shortages and people reselling iPhone X's for $5000. there is a market everywhere for this and people will pay it. it's a marker of social status not simply a phone anymore. when you are holding the ten and using it in your hands, it feels like a product from rolex. Sure it did. The first wave are the same crazy people that went out and bought the nonsensical MacPro trash can. This will normalize pretty soon in the states also. Only thing that saves it here is that most people pay it in installment plans. That's the only thing saving it anywhere. I know a ton of people with iPhones, but they won't upgrade until their contracts are through. Nice, but I picked up an 8 Plus yesterday to replace my 6 Plus and I'm content. Not surprised at all. The price is absolutely obscene in Europe. I wonder how many people in the UK are buying it? The average consumer/household is probably having trouble even paying mortgages, food, gas and electric bills etc. Simply not the same economic conditions compared to a few years ago. US prices don't include tax/vat/whatever you want to call it. If you exclude the tax from the price in other countries, you'll see that you end up with roughly the same price as in the US. The screenshot in the article clearly shows British Pound. The rate is 1.32 (Pound to USD), which gives us $1320 for the base model. I paid for the same model $1087 after tax in the US, so it's a $233 difference. I would not call it "roughly the same", it's a big difference. 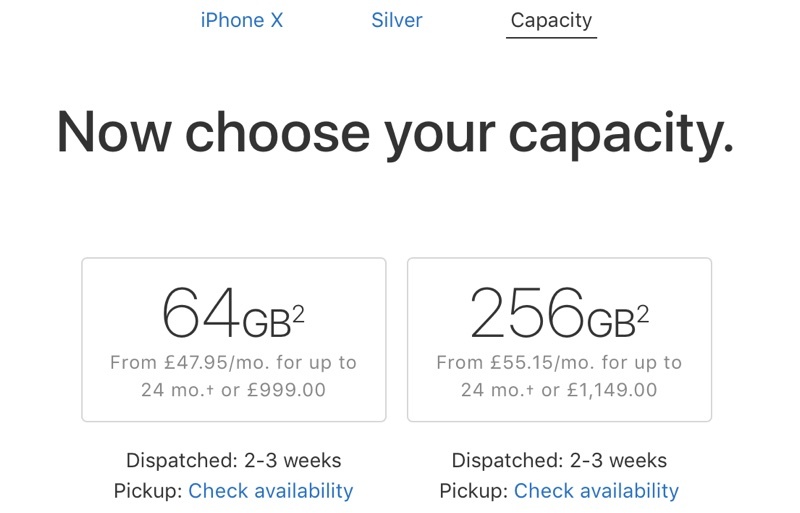 The 256GB model is $1516 doing the same math. That's insane. Frankly speaking. Well, I have one and I love it. However, I'd not compare it to a Rolex product lol. It's a solid phone. Their best iPhone in years even, but c'mon, let's not fool ourselves here please. It's still a mass product with all the issues that one can have.